Harry, Jill, Robynne, Ruth, Simon, Chas. 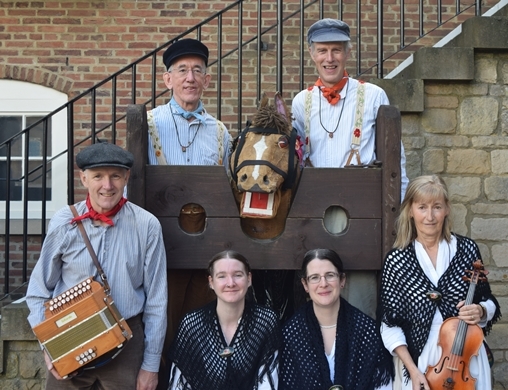 The team was originally formed in 1981 by students of the legendary clog dancer and music hall entertainer Sam Sherry. 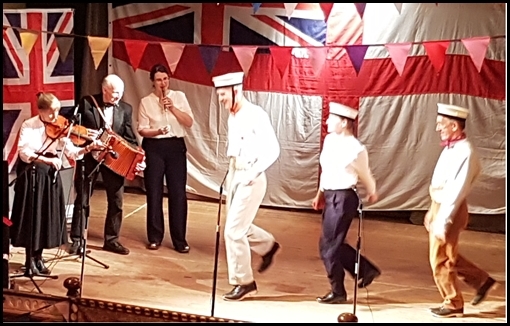 The purpose of their formation was a one-off performance at the National Gathering at Cecil Sharp House of the bargees social dance taught to them by Bill Gibbons. Their outfits are inspired by the clothing traditionally worn by canal bargees and the group includes a dancing boat horse. Why Wallopers? Walloping is an old Lancashire term for clog dancing. Their present repertoire includes routines based on most of the steps that Sam Sherry taught, steps danced by other celebrated clog dancers and dance routines in the style of the music hall as performed by The Five Sherry Brothers. The Five Sherry Brothers (1937) - Sailor! Where Art Thou? - song and dance routine. Sailor! Where Art Thou? - 80 years on. Sam had interests in both the traditonal styles of clog dancing and the music hall styles which are assumed to have developed, at least in part, from the former. The Wallopers continue that combination of interests. Wallop just likes showing off.